Geoff has been an NFL Mascot, worked with high profile athletes, executives, entertainers, and security professionals, has produced music events, award shows, and corporate events, has led the creation and launch of a well-known regional sports network brand, and is in his element when he is taking care of customers’ needs, especially while in the throws and chaos of a live event. In today’s world there is an ever-increasing need and effort to keep people safe while attending events. As more and more venues tighten their security policies and restrict the size, number, and types of items people can bring to events, there is a corresponding need to store and keep attendees’ items safe. Walker’s Lockers was born when Geoff saw an opportunity to help those on both sides of the equation. Venues instituting new and stricter policies with no good options for their attendees…and attendees left with no place to store their items when turned away from an event or venue. For venues and event producers, Walker’s Lockers provides a professional, secure, turnkey service that takes only moderate operation space and little time to setup and strike. It also offers a flexible solution that allows us to locate the truck(s) in areas that are close enough to be convenient, but also far enough away to minimize any risk to large gatherings of people. In addition, by focusing on a mobile solution, Walker’s Lockers can concentrate or distribute the trucks to meet the needs of the event ingress and egress flows of traffic. For event attendees, Walker’s Lockers provides a secure, professional service so participants can feel comfortable that their items will be securely stored while they attend their event, and safely returned to them when they come back to claim them. Walker’s Lockers carries both Liability and Bailee’s Customer insurance. Geoff started this service in the summer of 2016 after his experiences as the Event Operations Manager of the Copa America Soccer Tournament in Seattle led him to some ideas to support the Seattle Sounders FC soccer team and their upcoming “Clear Bag” policy. After a short trial and error period, and leaning on his past event, sports, and business experience, Geoff purchased his first truck, streamlined his operations process, and focused on the customer service experience. 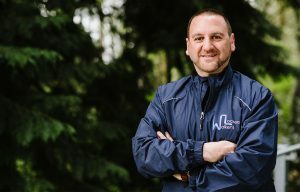 He quickly signed on to provide the service at Seattle Sounders and matches, followed by the University of Washington Husky and Seattle Seahawks football games. In 2017, Walker’s Lockers welcomed it’s newest client, Minnesota United FC (MLS) and is servicing their matches in Minneapolis, MN.